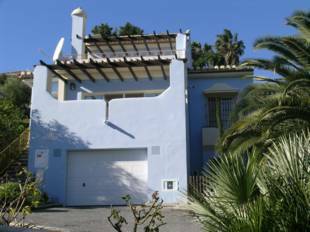 Cosy end townhouse in popular pueblo urbanization close to town. The townhouses in the development are of various sizes, this one we offer fore sale is the biggest with a charming tower bedroom. Comprising: Entrance with staircase to the 1. rst. floor, living room with stove and access to a lovely sunny terrace, nice fully fitted kitchen. 1. rst. floor: landing, 3 bedrooms one with balcony, 1 bathroom, staircase leading to the tower bedroom/ TV room. The development is placed in a quiet and child friendly area, there are 2 swimming pools and thus being close to town it has a stroke of landside. 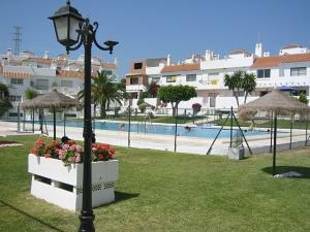 Spacious 105 sqm built townhouse located in a friendly quiet community with landscaped gargens, tennis courts and swimming pool. Comprises of 2 bedrooms, 1 bathroom with hydro-massage bath, 1 WC, fully equipped kitchen, large living room with fireplace, dining area, roof terrace with amazing sea views, BBQ area, patio, alarm system, satellite TV. Sold partly furnished and located at just 10 minutes walk from the beach and the Miramar shopping center. Superbly located 3 storey townhouse, just 2 minutes walk from beach, with lovely communal gardens & pool. Front & rear terrace, lounge, dining room, fitted kitchen, 4 bedrooms, some with terraces, 2 and 1/2 bathrooms. Great family or holiday. home for beach lovers. Viewing strongly recommended. 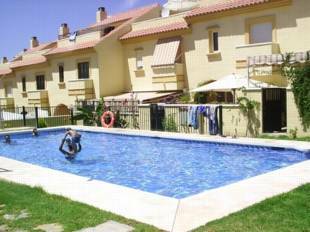 This 4 bedroom 2 bathroom townhouse is located in Fuengirola. It has a communal pool and gardens and a garage for 3 cars. This property is newly built and would make an ideal family home. 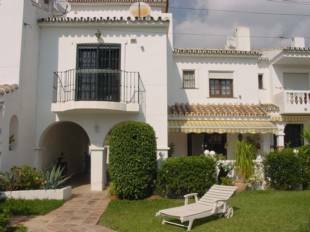 The property has a private terrace and large communal pool almost on the doorstep. The townhouse is very centrally located and is within walking distance of the beach, shops and restaurants. 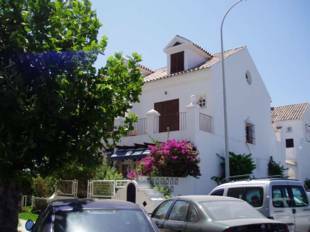 Semi-detached Townhouse 5 mins up the road from Fuengirola. This property has been decorated in traditional Rustic Style and has plenty of space and light. The sea view is panoramic, there are 2 terraces, a small private garden with a plunge pool to keep you cool, a fitted bbq and a large room on the ground floor, which the owners currently use as a snooker room with bar and loung area for entertaining. A must see! 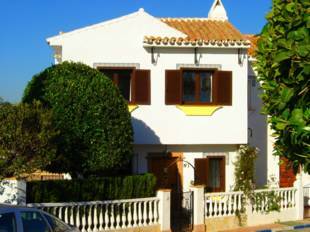 Pretty Andalucian pueblo style townhouse in a quiet location yet in the centre of Fuengirola within a moments stroll of shops, train station and all facilities. The property is in good order throughout and includes air con and central heating to bedrooms as well as under floor heating. Built on two levels with entrance level comprising: Lounge with fireplace and dining area. Fully fitted kitchen. Guest WC. Access from lounge to patio garden with workshop and storage plus automatic sprinkler system. Upper level comprises 2 double bedrooms and shower room with purpose built shower. In addition: Southwest orientation. Unfurnished. Alarm. Satellite TV. Telephone. Patio garden 35 square metres.